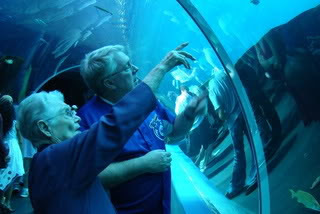 And we took her to see the Georgia Aquarium. She'd been wanting to go to the aquarium. And this weekend, she went. Actually, plans got jerked around a little bit through an unfortunate set of circumstances. My uncle died (father's side of the family; Grandma is mother's side of the family). That shifted things a little bit. Got complicated when my nephew (Big Sister's child) had a play at Valdosta State. However, things worked out. We went to Atlanta Friday night, met The Little Princess -- HUGE surprise for Grandma -- had supper, then went to the aquarium on Saturday. Her birthday was actually yesterday. Which meant we had to do her birthday trip either before or after her birthday. And, since her birthday usually gets jerked around by other family members' devotion to Florida State University football -- I mean, it's Seminoles football, not some old lady's birthday, after all -- we have to wait and see how the Semi-holes' schedule works out. So, this past weekend was the time-frame. Like I said, Grandma got a surprise visit from The Little Princess -- Grandma's 2nd great-grandchild. Supper at Ruby Tuesday was good. Except for the part where the waitress dropped a tray of big, tall, fruity drinks on us. But, the Little Princess showed up, and Grandma's thoughts turned there. She enjoyed the visit. And, when the Little Princess lead us around the aquarium, showing us all the exhibits -- she's the only one of us who had been before -- she was happy. The, on Sunday, we went to Valdosta to see Master Thespian ... my Big Sister's college student son ... in Doubt: A Parable. He played the child-molester priest. The weekend was fun. Got to celebrate with Grandma. We're looking forward to her 96th birthday. Happy Birthday to Basil's grandma! Grandma had a good time, indeed! With this year's celebrations being split between two weekends surrounding her birthday, she's getting to celebrate a lot. It seems just perfect for a 95th birthday! I thought that Grandma, you and The Wife, would enjoy seeing my son shine as a lead actor. (I left the play convinced that the priest was innocent of the accusations.) My son was grateful that his mom's family came in full force to see him in the play. It was not my intention to horn in on your special time with Grandma, and I apologize for the inconvenience. I appreciate your efforts last weekend. Never said it was an inconvenience. The issue was having a funeral in southeast Georgia, a trip to north Georgia, and a trip to south Georgia, and get back to work Monday morning. We did get it all in, and Grandma had a good time. How do I get a little picture by my comments? I want to put the one of me that's in the same picture as you at Ma and Pa's.